Kerry has started a new radio show, Up in Your Business with Kerry McCoy. 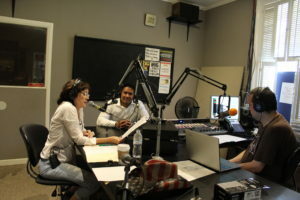 Check it out every Friday live locally on KABF 88.3 FM radio or stream it online at http://tunein.com/radio/KABF-883-s31318/! Miss it? Check it out in 24 hours on SoundCloud as a podcast. Go to the show archives for that episode wrap up and to listen to the podcast. “Up your business with Kerry McCoy” will help you discover how to navigate the path to achieve the American dream. 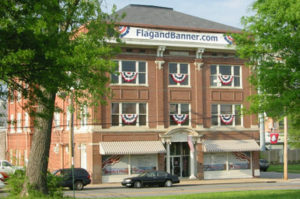 She started Arkansas’s FlagandBanner.com over 40 years ago with just 400 dollars and now it exceeds 3 million in annual sales. Each week she and a guest will answer your questions and offer real world advice on how to become your own boss. Tune in to this passionate, informative, high energy and often wacky perspective on business in the 21st century. Let Kerry McCoy get all up in your business! Live stream the show at 2pm CST on Friday’s! If you’ve never heard Kerry’s American Dream story, it is an amazing path from unemployment to owning a multi-million dollar company. Click here to read Kerry’s full story. Kerry McCoy and R.J. Martino of iProv Online during the Sept. 16, 2016 episode of Up In Your Business with Kerry McCoy. 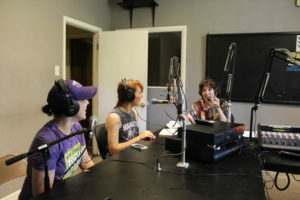 Guests Sally Mengel of Loblolly Creamery and Sara Slimp of Chunky Dunk with Kerry McCoy on Septeber 23, 2016. They talked about starting your own business, food trucks, accounting aspects and how to ask for help among other topics.